A TOWN based music group founded by 29-year-old Amanda Williams, will celebrate its fifth birthday in July. Warminster Philharmonic Orchestra hopes to build on the success it achieved in 2008 when it staged a sell-out proms concert in Upton Scudamore and filled the Athenaeum for a festive concert. Amanda, who has a degree in fine art and music from Brunel University, having studied piano and oboe, has lived in Warminster since 2002. When she arrived in the town she soon realised that Warminster needed to provide more options for musicians. “I have enjoyed playing with other orchestras but felt that there must be other people in my position who have studied music to a reasonable level at school and university and now have their instruments stuck under the bed due to the lack of groups in the local area,” she said. 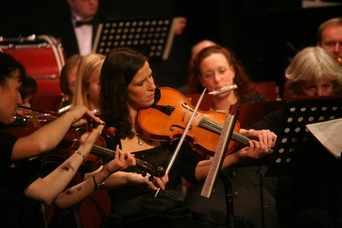 The Warminster Philharmonic Orchestra meet fortnightly and rehearse at Warminster School putting on two concerts a year. Amanda is also a volunteer for the local Warminster and District Link scheme and invited over 60 clients to come to the Christmas concert. This is only made possible by the Link scheme drivers and coordinators which the orchestra paid for their tickets to enable the clients to have a Christmassy night out. The Beckford Centre also had a presence at the concert running the raffle to help draw in much needed funds. The orchestra also donated over 60kg of food to the Trussell Trust food bank back in November. “I have always stated that the orchestra is a community group,“ said Amanda, who is the creative director for Fuzzy Duck Media. “The musicians can come along and be part of something fun and challenging while also benefiting the general public and local charities. The orchestra commence with Spring Term rehearsals from Tuesday 27th January. More information is on the website. New players are welcome.